The Pickstock Group’s student accommodation development in Colchester is standing strikingly on King Edward Quay. 57% of room modules have now been installed into the first phase of the development. Installation commenced just 8 weeks ago, in this time 216 room modules have been positioned. This first phase will comprise of 381 student Room Pods of seven room types as well as 60 kitchen Pods for the shared cluster flat option available at the accommodation. 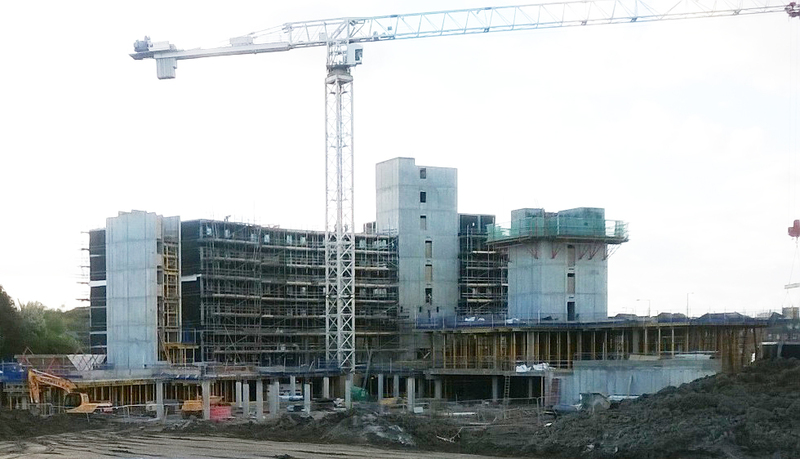 Concrete framework for each of the four blocks of accommodation is almost complete and the lift core and podium deck is being finalised to Block A. Work has commenced on the envelope of the building and cement board is being installed in preparation for the render. Phase 2 of the site, due to open in September 2015 is now being prepared with remediation and stabilisation works due to be complete next week. Piling rigs will arrive on-site mid-April and the second tower crane will be installed on the 23rd April. The second phase will comprise of an additional 398 student Room Pods, more than doubling the amount of student accommodation available to a total of 779 beds. In addition to this, 57 kitchen Pods will be installed to serve the communal kitchens for the cluster style of flats available at the scheme. Meanwhile, at the on-site marketing suite, students have been visiting to view the show flats and book their rooms in Phase 1 which will open this September. Students are currently on their Easter half term break, the marketing suite is preparing for the demand the show flat will see on their return to university later this month.